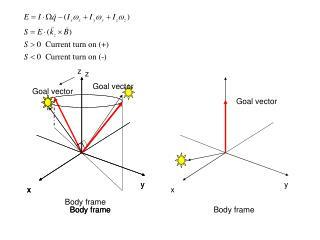 Cell position corrected forCell position corrected for z-vertex only. A cut is put on the electron candidate such that the total energy not associated with the candidate in a radius of R is eta-phi space is less than 10%. 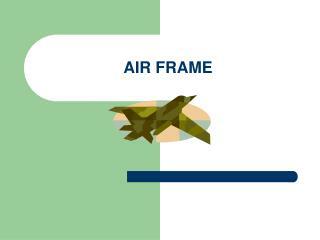 This removes photoproduction events and events where a jet remnant is falsely identified as the positron. 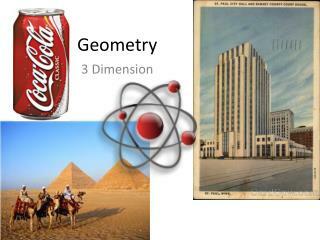 Electron corrected for dead material.Uncorrected Sinistra candidate is used. Evidence of further orange corrections/differences. 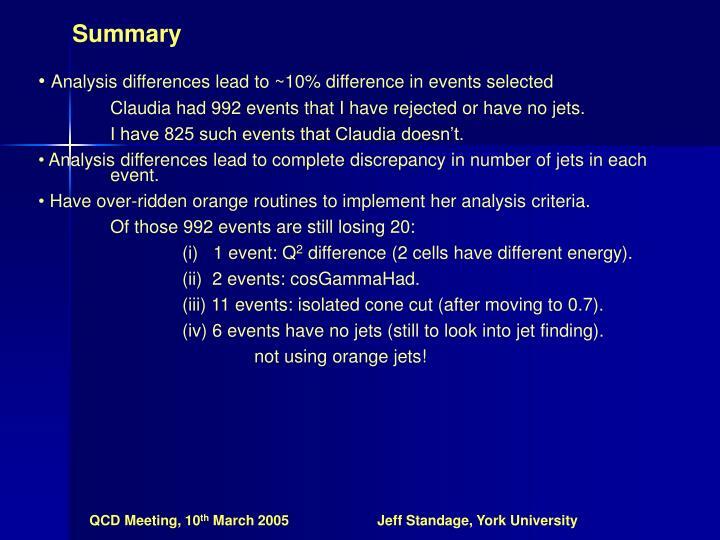 Claudia had 992 events that I have rejected or have no jets. I have 825 such events that Claudia doesn’t. 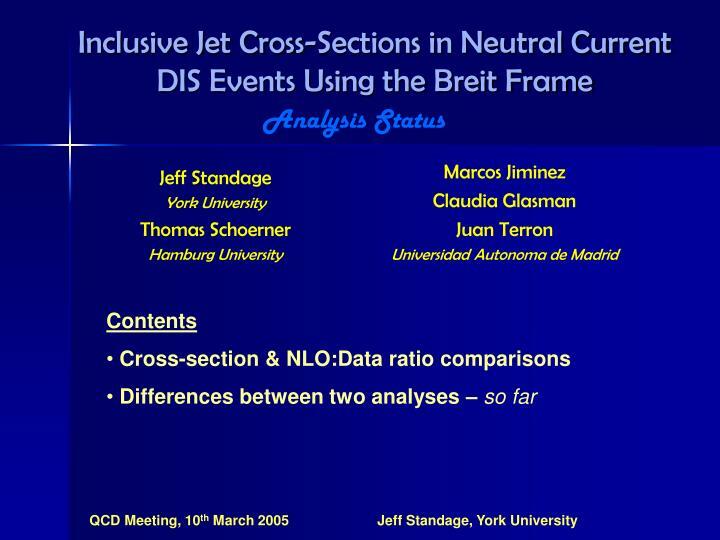 Analysis differences lead to complete discrepancy in number of jets in each event. 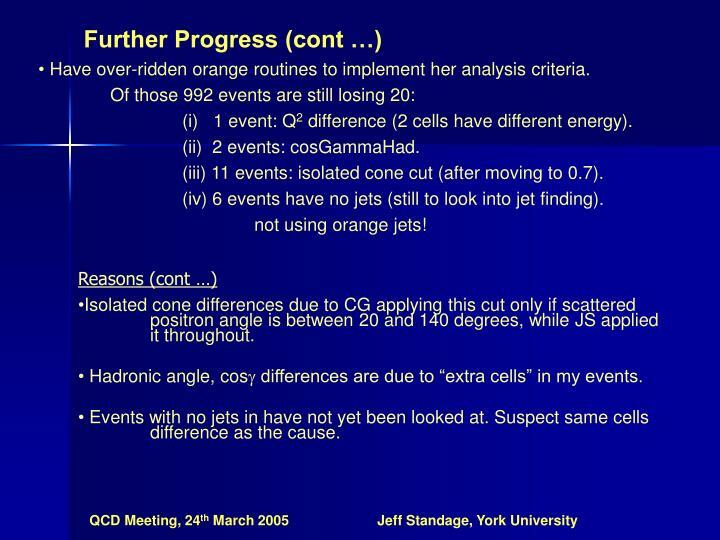 Have over-ridden orange routines to implement her analysis criteria. (i) 1 event: Q2 difference (2 cells have different energy). (iii) 11 events: isolated cone cut (after moving to 0.7). (iv) 6 events have no jets (still to look into jet finding). 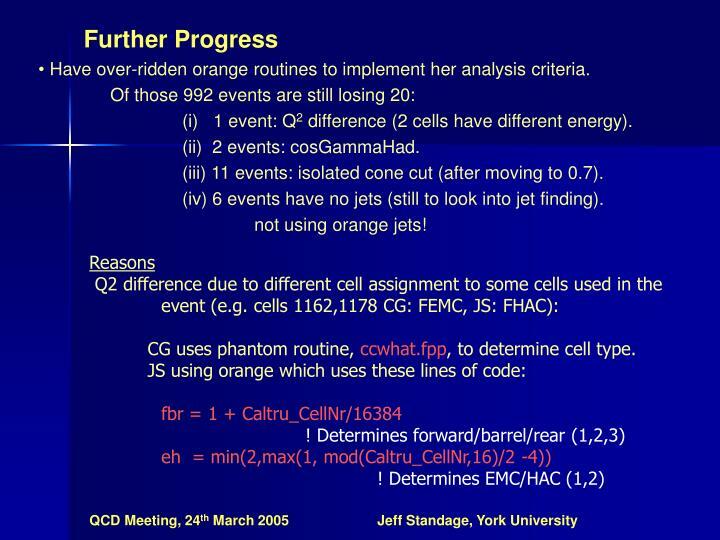 CG uses phantom routine, ccwhat.fpp, to determine cell type. 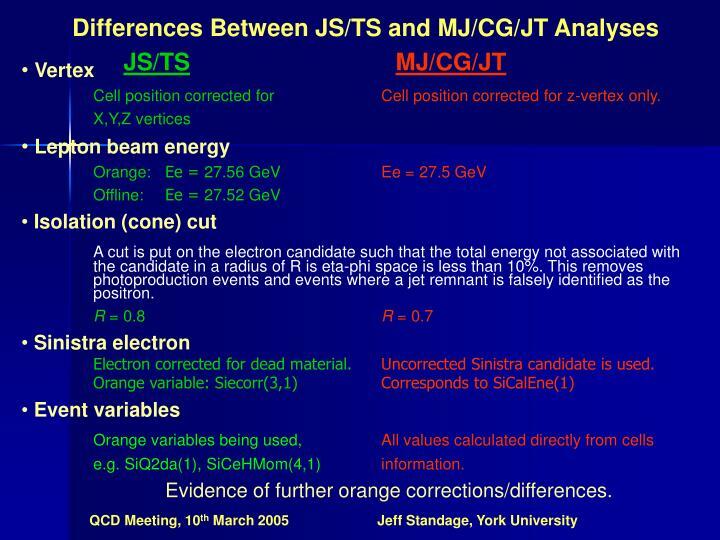 Isolated cone differences due to CG applying this cut only if scattered positron angle is between 20 and 140 degrees, while JS applied it throughout. 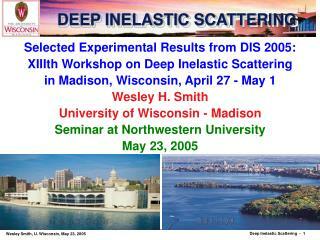 Hadronic angle, cos differences are due to “extra cells” in my events. Events with no jets in have not yet been looked at. Suspect same cells difference as the cause. 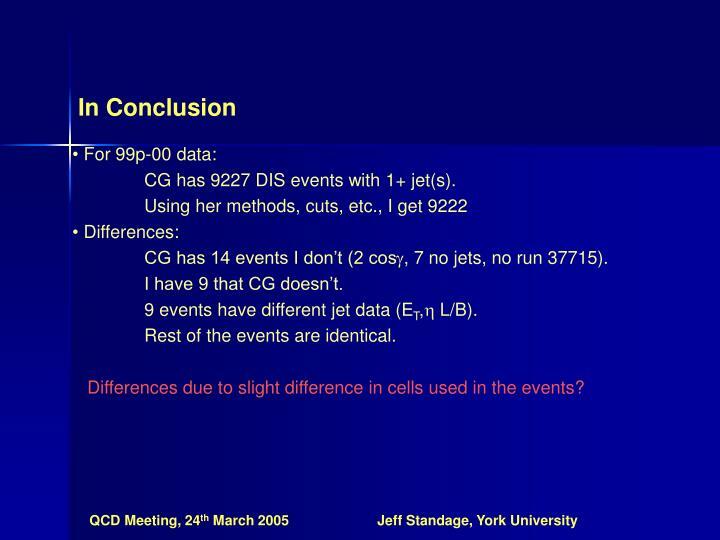 CG has 9227 DIS events with 1+ jet(s). CG has 14 events I don’t (2 cos, 7 no jets, no run 37715). I have 9 that CG doesn’t. 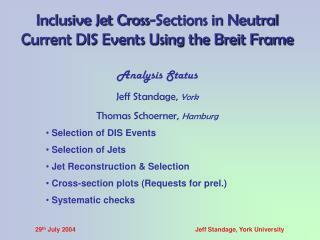 9 events have different jet data (ET, L/B). Rest of the events are identical. 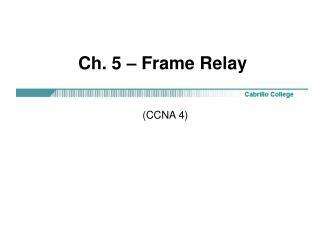 Differences due to slight difference in cells used in the events? Nail down last few events cut differences (worth it?). Currently comparing detector level MC. Decide which methods/corrections are the right ones (why)? Nail down last few events cut differences (worth it?). - Not worth it. Detector level MC. (no further changes). -CG has 20237 (1+ jet) events with 28679 jets. - JS has 20239 events with 29669 jets (no corrections). 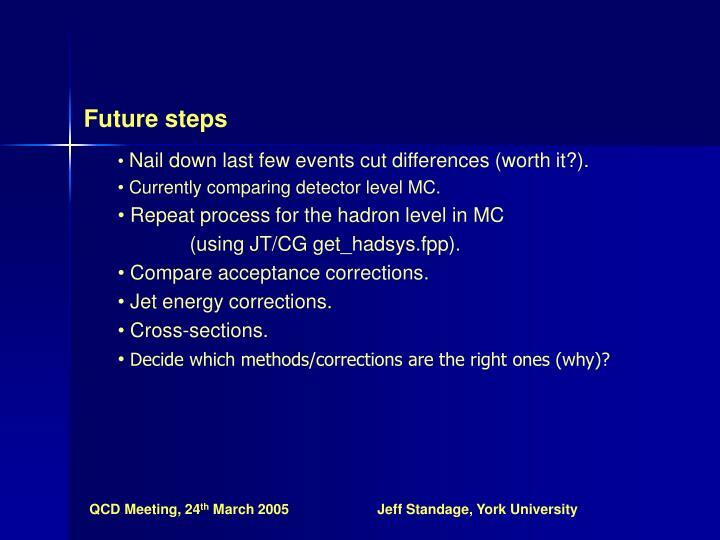 Repeat process for the hadron level in MC. 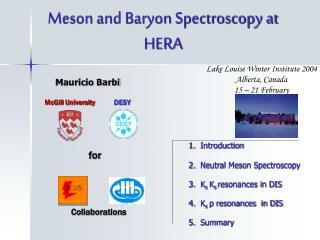 (scaling of massless hadrons). 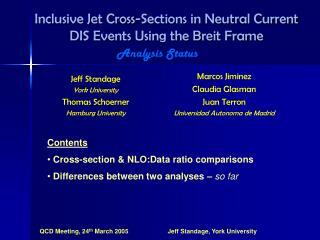 -CG has 32211 (1+ jet) events with 48526 jets. - JS has 32233 events with 48566 jets (no corrections). 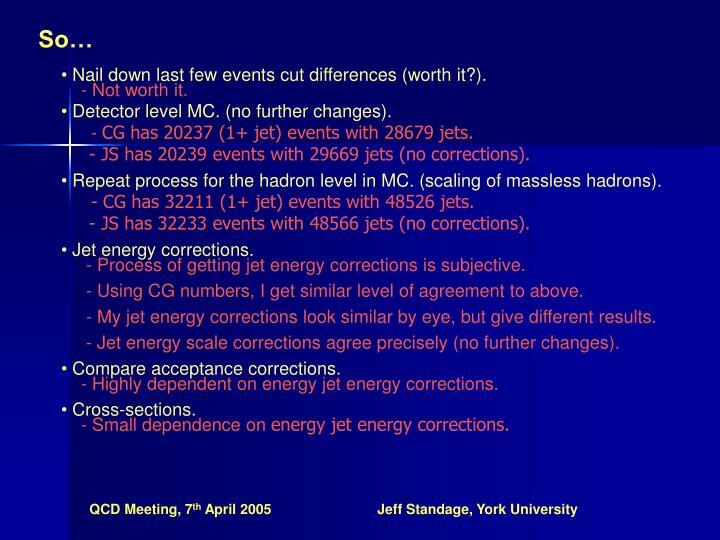 Jet energy corrections. 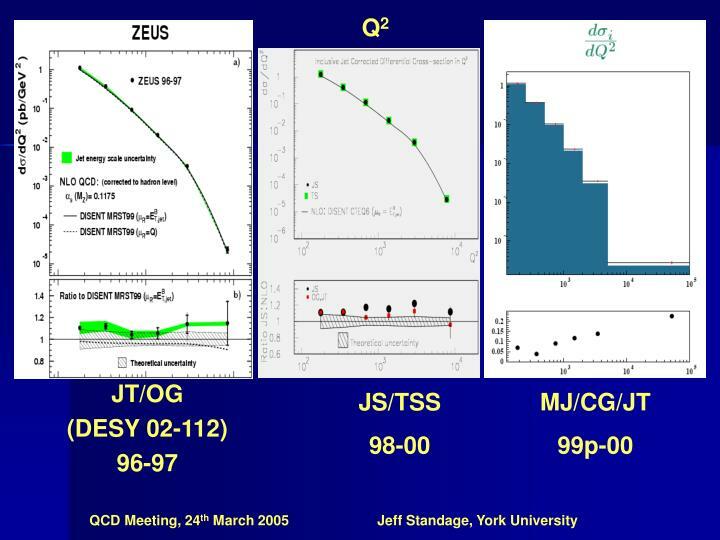 - Process of getting jet energy corrections is subjective. 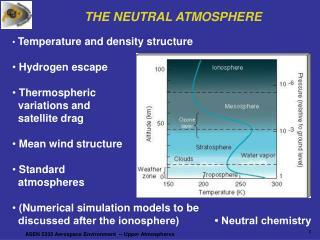 - Using CG numbers, I get similar level of agreement to above. 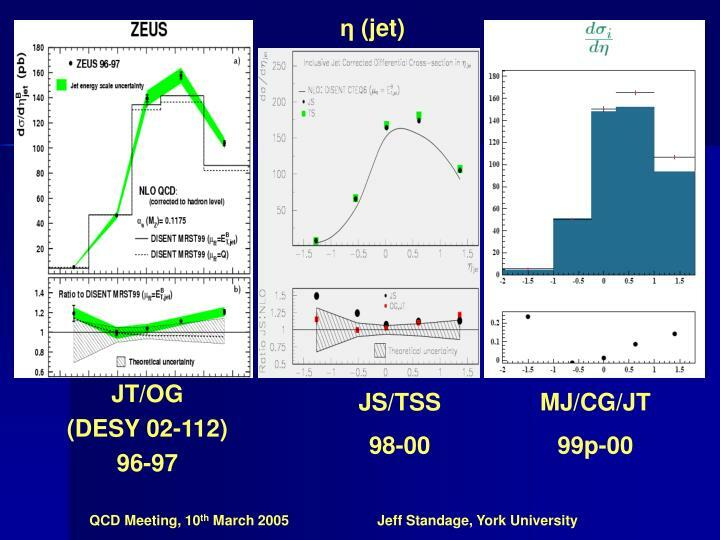 - My jet energy corrections look similar by eye, but give different results. 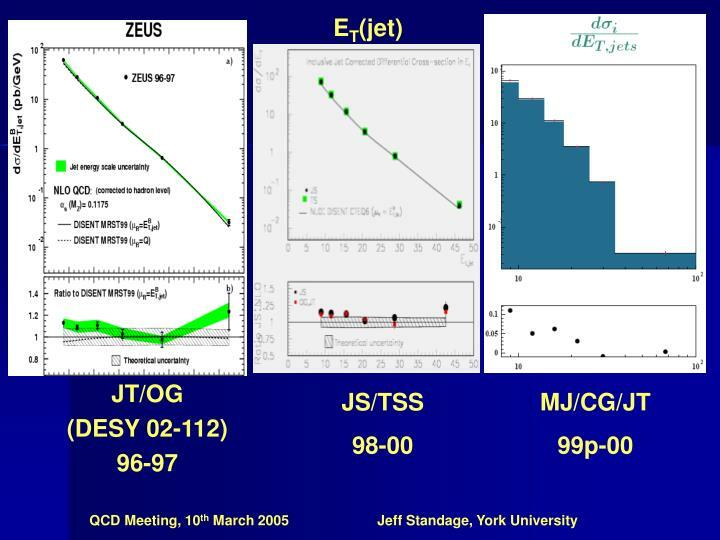 - Jet energy scale corrections agree precisely (no further changes). 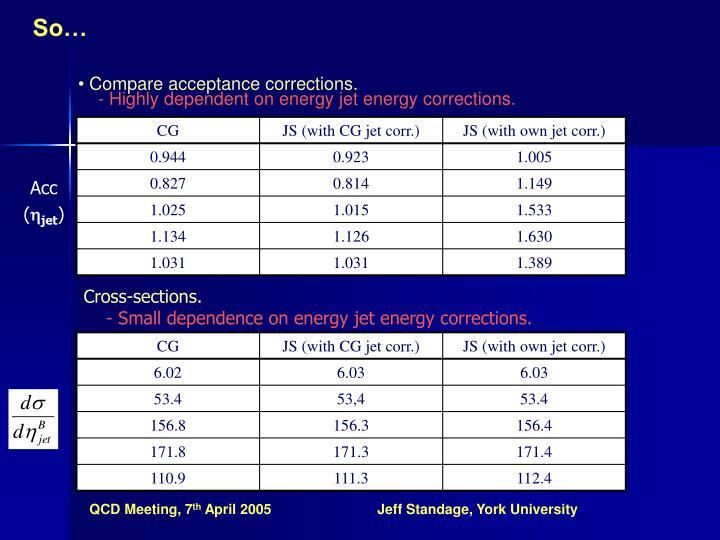 Compare acceptance corrections.- Highly dependent on energy jet energy corrections. 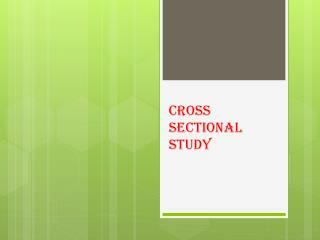 Cross-sections.- Small dependence on energy jet energy corrections. I have reproduced CG results using her methods. 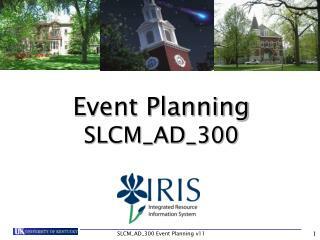 Details of differences between two analysis methods have been shown. 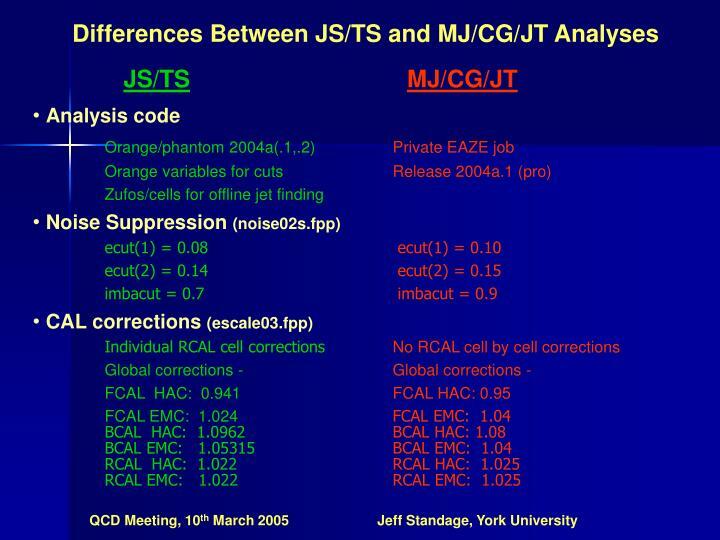 Differences between CG/MJ/JT and JS/TSS analyses now found and have been shown. Many differences seem to have a minor but cumulative effect. Results are very sensitive to scattered electron four-momentum effect on the boost to/from Breit frame. 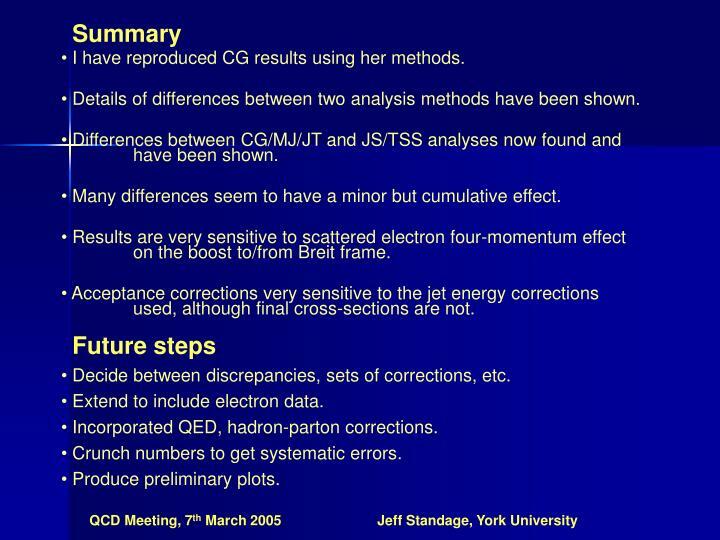 Acceptance corrections very sensitive to the jet energy corrections used, although final cross-sections are not. 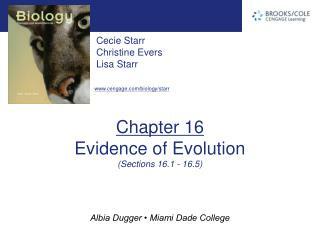 Decide between discrepancies, sets of corrections, etc. 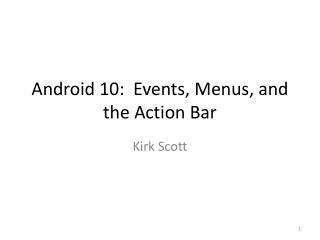 Extend to include electron data. 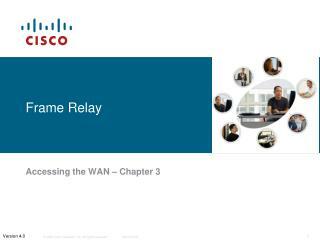 Crunch numbers to get systematic errors. 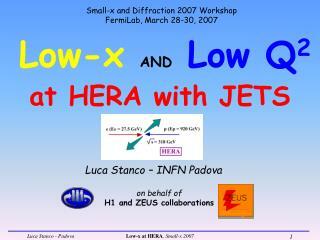 Low-x AND Low Q 2 -Small-x and diffraction 2007 workshop fermilab , march 28-30, 2007. low-x and low q 2. at hera with jets. 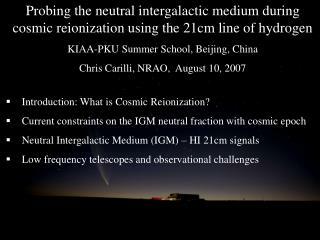 luca stanco – infn padova. 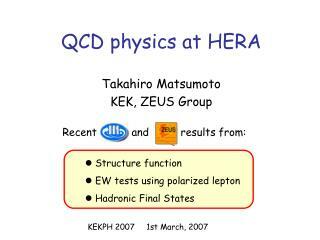 on behalf of h1 and zeus collaborations. direct g -production. photon. photon. 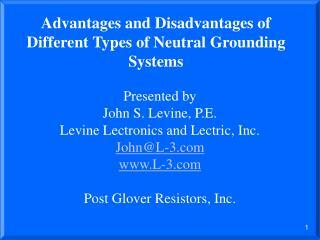 Advantages and Disadvantages of Different Types of Neutral Grounding Systems -. 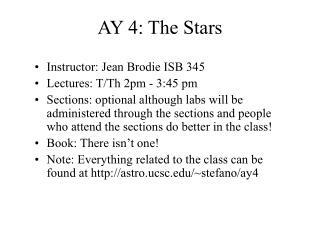 presented by john s. levine, p.e. 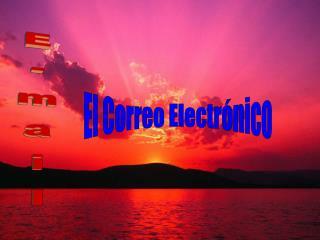 levine lectronics and lectric, inc. john@l-3.com www.l-3.com post glover resistors, inc. neutral grounding of power systems.